A visit to Srinagar wouldn't be complete without taking a few side trips out into the glorious Kashmiri countryside (after all, Kashmir isn't called the "Switzerland of India" for nothing!). It's filled with flowers in spring and snow in winter. Pretty Kashmiri villages with traditional wooden houses and colorful rooftops can be seen along the way. These popular tourist places in Kashmir are good starting points. The easiest way of getting around is to hire a car and driver. Your hotel or houseboat owner will be able to readily arrange tours. Otherwise, if you're on a budget, the state bus company runs day trips. Tickets can be booked from the Tourist Reception Center in Srinagar. Another option is this 5 Day Kashmir Valley Tour from Srinagar. Scenic Sonamarg ("Meadow of Gold") is famous for its Thajiwas Glacier. What's remarkable about this glacier is how accessible it is. From the highway, you can hike up to the glacier and back in around five hours. If you don't have so much time to spare, it's possible to ride a pony instead or take a shared taxi part of the way there. Scenes of many Bollywood movies have been filmed in the area, and you won't have to try very hard to feel like you're in one! There are a number of options for eating and staying at Sonamarg. Ahsan Mount Resort has fabulous Swiss tents for glamping. Hotel Snowland is conveniently positioned but could be managed better. Location: On the Srinagar-Ladakh Highway, 2.5 hours northeast of Srinagar. Travel Tips: Be aware of aggressive local touts, pony owners, and taxi drivers who try to exploit tourists. They quote really high prices, especially during peak season. Do bargain hard. The Tourist Reception Center opposite the main market in Sonamarg is the best place to get information and approved taxi rates. Visit from mid-April to June if you want to go there for the snow. 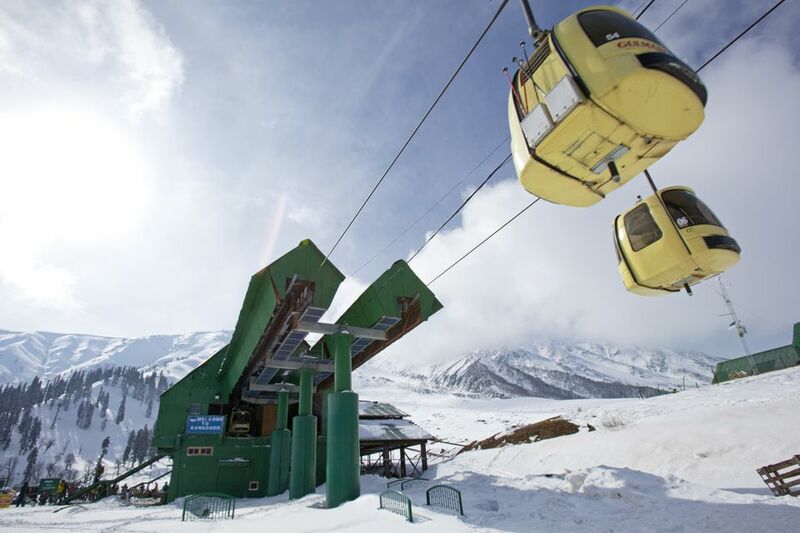 Gulmarg ("Meadow of Flowers") is India's version of a ski resort. If you're not into skiing, you may still want to let the gondola whisk you more than 13,000 feet up Mount Apharwat for outstanding views. Apparently, it's the world's highest cable car. Ubiquitous pony rides are available in Gulmarg as well, and their owners are also aggressive in pestering tourists for business. If you feel like splashing some cash, treat yourself to a couple of nights at the Khyber Himalayan Resort and Spa, one of the ​top Himalayan Spa Resorts. Location: Less than 2 hours east of Srinagar. Travel Tips: The ski season runs from mid-December to mid-March. The gondola is very popular, so do buy your tickets online to avoid long queues. Unfortunately, you'll still have to wait to board it though. Pahalgam ("Valley of Shepherds) is a popular destination for trekking and adventure tourism. Visitors commonly head to Betaab Valley (the Bollywood movie "Betaab" was shot there), with its fresh flowing Lidder River and surrounding snow-capped hills. However, do note that you'll only be allowed to take your vehicle up to a certain point to reach the Valley. After that, you'll need to hire a prepaid vehicle provided by the local transport association or walk. Entrance to the Valley is regulated and costs 10 rupees. Other possible activities around Pahalgam include golfing, trout fishing, and river rafting. Location: Around 3 hours from Srinagar. Travel Tips: It's near the departure point for pilgrims going on the Amarnath Yatra, so avoid visiting during July as it will be very busy then. Yousmarg is a sprawling meadow that's refreshingly underdeveloped (only a couple of restaurants are there). The highlight is the Doodh Ganga River, which is reached by a picturesque 30-minute walk along a forested trail down a hill. Alternatively, it's possible to take a pony. (Don't give into the insistent pony owners if you want to walk). On the way to Yousmarg, you'll pass numerous apple trees, as well the town of Charar-i-Sharief. It's worth stopping there as it's home to one of the holiest Sufi Muslim shrines in India, and some of the biggest halwa parathas you'll ever see! Location: 2 hours southwest of Srinagar. Travel Tips: If you spot anyone selling apples on the roadside, get some as they're delicious! If you want to get away from the crowds, head to Sinthan Top. This mountain pass is situated 12,000 feet above sea level in south Kashmir's Breng Valley. Interest in it has grown since construction of the Kokernag-Sinthan Top-Kishtwar Road, connecting Kashmir with Jammu, began. It's yet to be developed though, so there's an absence of facilities for tourists. If you want to stay in the area, Daksum or Kokernag are good choices with more options for accommodations. They're excellent places to go trekking and exploring the great outdoors. A nature trail leads all the way up from Daksum to Sinthan Top. Location: About 2.5 hours from Srinagar. Travel Tips: Stop at Daksum, downhill, where there are tourist facilities.